The colors and prints of Florabelle are just so rich and wonderful and I had so much fun making up a design for this Florabelle Bloom quilt that I think really highlights those stunning prints and beautiful colors :) And now I get to share that design with all of you as well :) So let's get right to the tutorial!!! Start by first pressing all your fabrics :) It really helps for accuracy in cutting and piecing. Then from your 21 pressed Fat Quarters, choose 1 (I choose the Floral Gem in Tucson print) to be your sashing corner stones. The other 20 Fat Quarters will be your blocks. And now, you are ready to start cutting. 4 squares 4 1/2" x 4 1/2"
6 squares 3" x 3"
5 squares 2 1/2" x 2 1/2"
* I layer a 3-5 fat quarters at a time on my cutting mat for this to speed things up. 30 squares 2 1/2" x 2 1/2"
5 Strips 4 1/2" x WOF - Subcut into 80 rectangles 2 1/2" x 4 1/2"
9 Strips 3" x WOF - Subcut into 120 squares 3" x 3"
10 Strips 2 1/2" x WOF - Subcut into 160 squares 2 1/2" x 2 1/2"
3 Strips 14 1/2" x WOF - Subcut into 49 rectangles 2 1/2" x 14 1/2"
From your Grey Solid cut 8 Strips 2 1/2" x Width of Fabric for your binding. We will start with making a whole bunch of Half Square Triangle units. To do this, grab your 3" x 3" print squares and on the back of each one (there should be 120 total) draw a diagonal line from corner to corner. Now grab your stack of 3" x 3" white background squares. Place a marked print square on a background square with right sides together. We will be sewing a 1/4" seam on either side of the drawn line. But to save time, we will chain stitch these. If you haven't chain stitched before, it's super easy and saves time and thread. Just begin sewing the first square 1/4" from the drawn line, but when you get to the end of the square, don't cut your threads. Simply feed the next square through your machine, continuing on until all 120 squares are sewn on the left hand side of the drawn line and you have a giant train of small squares. Then go ahead and clip the threads between each square. Align a ruler along the drawn line and cut your square into two triangle pieces. Then press the seam allowance of each piece towards the print fabric. You will now have 240 HST's. And they all need to be trimmed ;) Aligning the diagonal line of your square ruler with the seam of your half square triangle trim your HST to 2 1/2" x 2 1/2" square. If your ruler is larger than 2 1/2" x 2 1/2" square trim the right hand side and top of your units first and then rotate them to trim the remaining 2 sides. If your ruler is 2 1/2" x 2 1/2" you can simply trim all 4 sides. If you need a more detailed description on trimming HST's you can see this tutorial that goes into it with more depth. And now we can make the next units in our block, the Side Units. You will need your pile of white background 2 1/2" x 4 1/2" rectangles and (4) of each of your print 2 1/2" x 2 1/2" squares. This should leave you with 1 print square 2 1/2" x 2 1/2" of each fabric, 20 total, that can be set aside until later. Place a print square on the end of the 2 1/2" x 4 1/2" rectangle with right sides together and sew a 1/4" seam along the end. Chain stitch all 80 sets, again this will save time and thread. Then clip your threads and press the seam allowance towards the Print square. You should now have 80 Side units that are 2 1/2" x 6 1/2", 4 units of each of your 20 prints. - For the Top Point Unit, place a HST triangle onto a 2 1/2" x 2 1/2" background square with right sides together as shown in the first box and stitch a 1/4" seam along the edge. Again, if you stack up all your sets and chain stitch all 4 sets of each print, so 80 total, this wills save time and thread. - For the Side Point Unit, place a background 2 1/2" x 2 1/2" square onto a HST triangle with right sides together as shown in the second box and stitch a 1/4" seam along the edge. Chain stitch all 80 units. - Then for both sets of units, press the seam allowances towards the Background square. You should now have 80 Side Point units that are 2 1/2" x 4 1/2", 4 units of each of your 20 prints. And you also have 80 Top Point units that are 2 1/2" x 4 1/2", 4 units of each of your 20 prints. Place the right hand units onto the left hand units in each row with right sides together and edges aligned. Sew a 1/4" seam along all your edges (however much you are chain stitching). Now lay the top row onto the bottom row and align and pin the seam. Then sew a 1/4" seam along the pinned edge, again chain stitching all your sets. Again, I like to Press that last seam open, but you can choose to press it to one side if you prefer. You should have 4 Total Corner Units measuring 6 1/2" x 6 1/2" square. And now you are ready to make the block. Layout 4 Corner Units of the same fabrics, 4 Side Units of a different fabric, and one print 2 1/2" x 2 1/2" print square (the one left over from earlier) that fabric matches the HST's in the corner of your Corner Units as shown below. Place the center unit in all three rows onto the left hand unit with right sides together. Sew a 1/4" seam along the edge of all three sets. Then clip your threads and lay your pieces back out on your mat making sure everything is still aligned. Then place your right hand units onto the center units with right sides together. Sew a 1/4" seam along the edge of all three sets and then clip your threads. Press the Top and Bottom rows towards the center and Press the Middle row away from the center. Lay your Block out again and make sure everything is still lined up. Then place the Middle Row onto the Top Row with right sides together. Align and Pin the seams and edges and then sew a 1/4" seam along the pinned edge. Once again, layout your pieces on your mat and double check alignment. Then place your Bottom Row onto your Middle Row with right sides together and align and pin your seams and ends. Sew a 1/4" seam along the pinned edge and then clip your threads. And now with your blocks all made, we can move onto the sashing and be that much closer to getting this done!!! We will be using the 2 1/2" x 2 1/2" Print Sashing Corner Stone squares and the background 2 1/2" x 14 1/2" rectangles. Place two Print square on either end of the background rectangle. Sew a 1/4" seam along the edge. You will be making 6 sets so you can chain stitch 6 sides on the left, and then clip threads and chain stitch 6 sets on the right. Then clip your threads and press the seam allowances towards the background sashing strip. And now is where it all comes together!!! Layout your blocks in 4 rows of 5. Play around with the placement of the prints in your blocks until it is pleasing to the eye. Once you like it, take a picture of it so your can refer back to it (it also helps to take a picture to make sure all your colors are balanced as that is much easier to see if your eyes don't have to move ;) Now, layout your Sashing Rows between each row of blocks and layout a Background 2 1/2" x 14 1/2" rectangle in between each of your blocks and and at the beginning and end of each block row. And now you can start sewing it all together. Start by placing the Background 2 1/2" x 14 1/2" rectangles onto the blocks with right sides together. There will be 2 strips on either side of the first block in each row. Sew a 1/4" seam along the edge of all. Again, you can chain stitch these to save time. And now, it is simply sewing all the rows together. Start by sewing the Sashing rows to the Block rows. Lay the Sashing rows onto the Block rows with right sides together. Align and Pin the seams and then sew a 1/4" seam along the pinned edges. And now it's just sewing the Sashed Block rows together. Place the Second row onto the First row with right sides together. Align and Pin the seam allowances. Then stitch a 1/4" seam along the pinned edge and then press the seam allowance towards the sashing. Then place the Third row onto the Second row with right sides together, align and pin the seams, and then stitch a 1/4" seam allowance along the pinned edge. Again, press towards the sashing. Repeat the process for the Forth and Fifth row. And just like that, your Florabelle Bloom quilt top is done!!! Way to go!!!! When it came time to quilt mine I decided on an all over medium size feathered swirl. I think this is such a fancy design that really adds to those gorgeous prints. And I just love how much wonderful movement it creates. I used a favorite 402 Pearl thread that blends perfectly with the white and all the prints. And it also makes for some gorgeous texture!!! Doesn't that just make you want to snuggle up with it and a good book :) All that is left now is to use the (8) 2 1/2"x 42" grey solid binding strips you cut at the beginning to create a binding and add it to the quilt. And your Done!!! 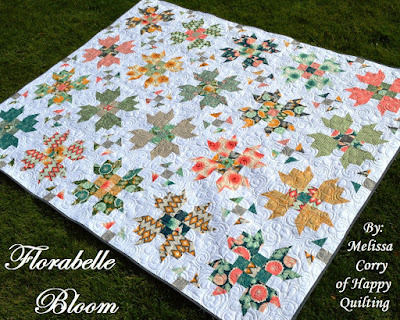 And now, just sit back and enjoy your beautiful Florabelle Bloom Quilt!!! It finishes at 66" x 82" so it is a great lap size quilt just perfect for snuggling in. And as you can see, with all that chain stitching it will go together super fast and is so much fun to make!!! I hope you have enjoyed this tutorial and if you make your own Florabelle Bloom Quilt I would love to see it!! You can email me a picture at happyquiltingmelissa@gmail.com or add it to my flickr group here or post it to social media with the hashtag #happyquiltingwithmc ;) I can't wait to see your Florabelle Bloom Quilts!!! Thank you so much to Free Spirit Fabrics for letting me play with these beautiful new Florabelle Fabrics by Joel Dewberry and Thank you so much for stopping in today to share this tutorial. And thanks for popping in each and every day. I am just so grateful to have this space to share my love of quilting!!! This is so darling! I love the color palette and I especially love that print with the llamas! This is beautiful! Love this quilt design. What a pretty block! So feminine. This is a beautiful quilt and I have added it to my list. Your tutorial is well written and I may just have to make a few blocks and create a couple of reversible pillowcases or covers! Thank you for sharing and have a great day! Very pretty quilt! I love your design! Thanks for the tutorial. Wonderful tutorial...thank you so much for sharing. I don't have Florabelle...but I have another fat quarter bundle I've been waiting to use. Oh I love this!! Thank you for sharing!! On vacation right now but will be adding onto my list of quilts to make as soon as I get home!! You could not have put two more suited features together--I love the fabric and I love the pattern!! It turns out a quite beautiful quilt! Thanks, I may be stealing your project ideas! What a sweet quilt. It would be such a joy to lay under those flower blocks. Beautiful quilt! It's on my "To Do" list. It's so pretty - great with Christmas fabrics I'd imagine as they look like little table crackers crossed to me. And I love the way you have taken a photo of how organised the cutting of the fat quarters are and laid out. Now I see how it's done with little waste. Thank you so much for sharing it all and I love the llama fabric too. Another stunning design!!! the fabric is gorgeous too, I love it!! Oh my! Lovely quilt! Thank you for so generously preparing this detailed tutorial! This is beautiful. And the tutorial is easy to follow. Such a stunning quilt! love your fabrics and your lovely quilting. Thanks for the tutorial!! This is really gorgeous, and shows off those fabrics very well! Thank you for taking the time to create and share that excellent tutorial. I do want to make this one day. This is absolutely beautiful! Thanks so much for sharing! This went high on my list of next to makes! Such a great pattern to show off this beautiful fabric. Thanks for sharing.